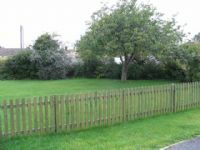 We have a large enclosed secure garden for the children to enjoy. In the winter we wrap up in coats and wellies and use the garden as often as possible to exercise, hunt bugs, plant things, dig, use the mud kitchen, explore nature and enhance the children's learning. We also play games, for example, What's the time Mr Wolf, circle songs and rhymes. In the summer we often spend the whole session in the garden and have access to equipment to promote fine and large gross motor skills. 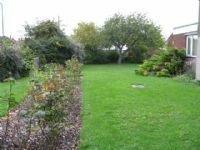 Additionally, we are able to offer a wide range of activities during these sessions, for example, craft, stories, singing, small world, mud kitchen, gardening, assorted balls, exploration activities and water play. We are currently participating the RHS Gardening Award. We have completed Level 3 (April 2018) and are now working towards Level 4. Our reward for Level 3 was a years supply of fruit and vegetable plants (arriving from April 2018). 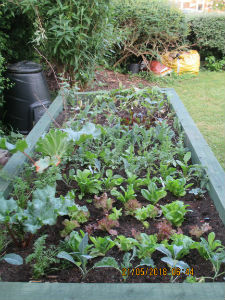 We have a new raised garden bed to be able to plant these when they arrive. 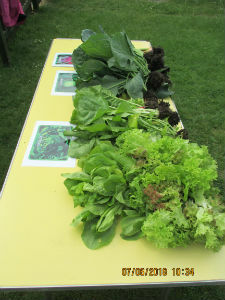 In previous years, the children have grown vegetables, harvested them and made vegetable soup. Children understand the importance of preparing the soil, how to care for the plants, understand the growth cycle and how to harvest their food.